The Sony 65" OLED HDTV with 4K Blu-ray/DVD player in the living room and a Sony 55" HDTV with Blu-ray/DVD in the master bedroom make this 3 bedroom / 2 bath condo a sports fan's favorite. There are also flat screen TVs with Blu-ray/DVD players in both guest bedrooms. If you are a Netflix customer, streaming movies are available on all TVs. In addition, a reading library, games, puzzles, a personal computer with internet access, free WIFI, and a cordless phone with answering machine are available. 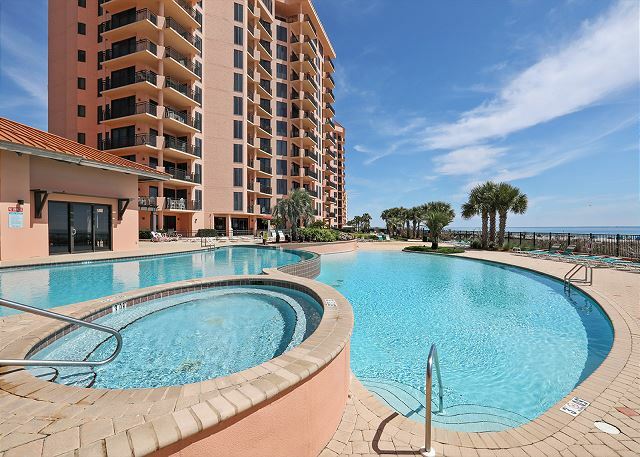 Views of the Gulf from the master bedroom, the living area and large balcony as well as Caribbean style decor make this 1,675 square foot condominium a renter's favorite. The completely renovated kitchen includes ice maker, microwave, dishwasher and laundry area with full size washer and dryer, granite counter tops and stainless steel appliances. Other features include 9-foot ceilings, ceiling fans, central heating and air conditioning, a large newly-renovated master bath with a granite counter top and whirlpool tub, separate glass enclosed shower, double vanity and lots of closet space. The second bath is also fully renovated with granite counter tops and a double shower. Overall our Rental Experience was good. We've stayed in this unit two years in a row. Arrived on Saturday before Labor Day and parking situation was very bad. One of my guests had to park across the street for a couple of days. I can't imagine staying there in peak summer, like July 4th! There were times when the WIFI would not work on multiple devices at the same time. We were there during the Tropical Storm Gordon and noticed one of the elevators had water leaking in it. Seems a little dangerous; our 2-1/2 year old slipped and fell. There were a few other small tweaks with the condo that I informed management about and said it was not a rush to attend to it. 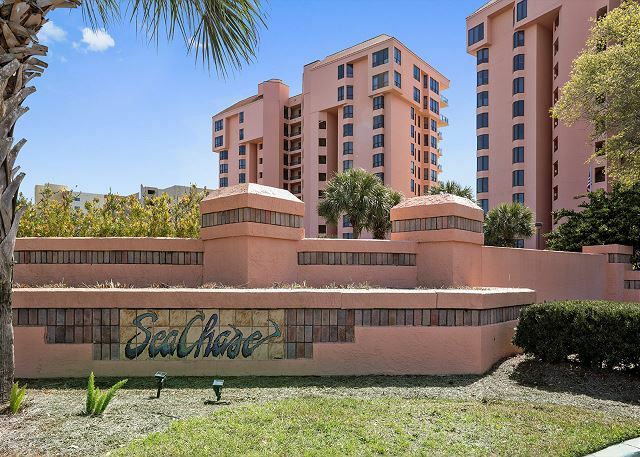 We love the Seachase complex and this unit, but I think I will be looking for a 3 bed, 3 bath next time. We just need that third bath. Thank you for using the Aronov Gulf Coast team for your SeaChase reservation. We appreciate your feedback and will pass it on to the condo owner and the property manager. We hope to see you at SeaChase again soon! Very nice amenities at this unit. Unit was well-maintained and kitchen had all of the appliances we could ask for. The master bedroom and bath were very spacious. The other two bedrooms were adequate. Beach was great this year except for the green algae. Thank you for choosing the Aronov Gulf Coast team for your summer vacation. We're so glad you enjoyed your stay at SeaChase and look forward to your return. We're so glad you enjoyed your stay with us and look forward to seeing you again soon. We will also forward your concerns to our housekeeping staff. This condo was great! Very well stocked in the kitchen. Great views and plenty of living area. It would be nice if two parking passes were included instead of only one. But, we had a great time. This is the best time of year to go! The condo was as nice in person as it was in pictures. It was appointed very well - nice linens, towels, dishes, cookware, etc... The only issue was that the ice-maker in the refrigerator didn't work properly. However, the other ice make more than made up for it. The dryer took a couple of cycles to dry clothes but that was not a problem for us. We enjoyed everything about the condo. Would definitely stay again. We had a great time at the sea chase. The room was nicer than we expected. Pictures did not do the room Justice. The pools were awesome and the kids loved the indoor pool too. It was nice being so close to everything including the grocery store. We will definitely be back again soon. This rental was everything we hoped for and more! There was not a single item we looked for in the kitchen that we did not find. The view was breath taking, and the staff was so helpful when we needed anything. Very good. Note: Refrig had a dent on the door when we arrived. New furniture was very nice. The Condo, staff and stay was outstanding. Best Condo we have ever stayed in at Seachase. The owners have done an excellent job of providing a decor that makes you feel pampered and at home the minute you open the door. Provided a great space that allowed us to enjoy our grand children and all things offered at Seachase. We will be back! My granddaughter left an iPad in the room. Karen at the front desk and the owners quickly retrieved the iPad and made arrangements to return via mail. Great and friendly staff and owners? ?